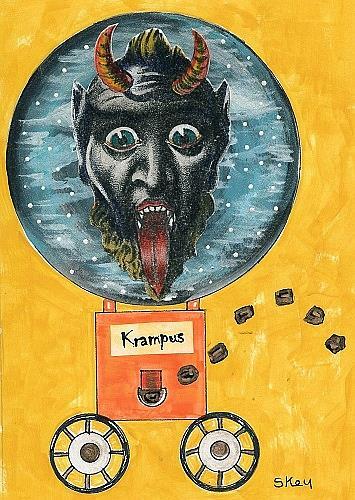 December's Nibblefest NFAC theme is "Krampus." I had never heard of him until this theme came up. Apparently he is the anti-thesis to St. Nicholas and is the one that gives coal to all the misbehaving children. Per Wikipedia: Krampus is a horned, anthropomorphic folklore figure described as "half-goat, half-demon" who, during the Christmas season, punishes children who have misbehaved, in contrast with Saint Nicholas, who rewards the well-behaved with gifts. Original hand painted collage of a vintage Krampus head floating in an original hand painted and illustrated coal spitting globe machine. The globe is actually shiny and glittery which doesn't show up in the photo of the painting.